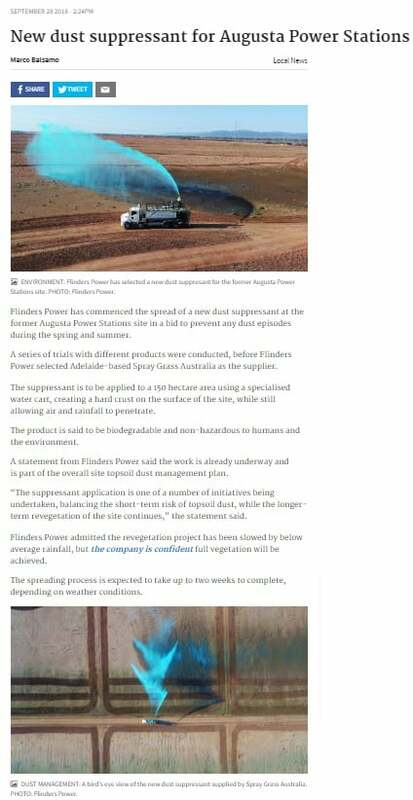 Flinders Power has recently awarded 150 hectares of dust suppression works at Port Augusta Power Station to Spray Grass Australia. Flinders Power conducted trials with a range of different dust suppressants. HydroBond was the chosen solution due its dust suppression performance, added benefits to plant germination and not impeding existing vegetation. The product was ideal for the environment on the ash storage area as it is non-hazardous, biodegradable and allows air & water to infiltrate into the surface.